The Enterprise Edition provides the capability to graph data with a few simple selections from the Report Charting and Report Columns sections of the Layout panel. 5 chart styles (Vertical bar, Horizontal bar, Line, Pie and Scatter-XY) are available with over 25 variations of these styles. There are over 40 chart characteristics that can be controlled. The following instructions describe the available controls and their use, along with examples of the resulting charts. QLR Manager supports chart creation using two different chart generation packages, JpGraph and FusionCharts. JpGraph is a licensed version bundled with QLR Manager. FusionCharts is included as a fully functional evaluation copy, which produces charts that display the phrase "FusionCharts XT Trial" in the lower left corner of the chart. A production copy of FusionCharts can be purchased from FusionCharts. To install the production version, simply copy the production files into QLR Manager's /fusioncharts directory to overlay the evaluation version. When creating a chart, the User can specify which of the two charting packages they wish to use. In addition, when choosing "Compare", the chart from both options will be displayed, allowing the User to choose which of the two options produces the more desirable output. JpGraph generally produces better results when smaller chart sizes are desired, primarily because it allocates a larger area for the data plots. JpGraph also produces png files which can be embedded directly into e-mails. In general, FusionCharts produces higher quality output, especially when creating Pie Charts and other charts in larger sizes. FusionCharts offers chart types that do not exist in JpGraph, such as Doughnuts, Scrolling Bar Charts, and 3 Dimensional Charts. 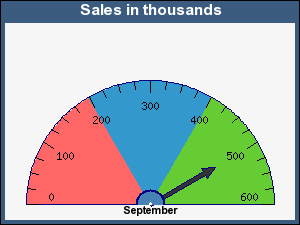 FusionCharts does not create an Odometer chart type. Some examples of the output from both charting packages are illustrated below. • Select a "Position" for the chart in the Reporting Charting section of the Layout panel. • Choose at least one column of numeric data to plot in the Report Columns section of the Layout panel by setting the Chart use = "Plot", or "Plot+" to display the values above the plot. In most of these examples, the charts are produced with a chart size of 400 x 300 pixels using a landscape orientation. • Specify a General style of "Vert Bar" using the General characteristics controls in the Report Charting section. 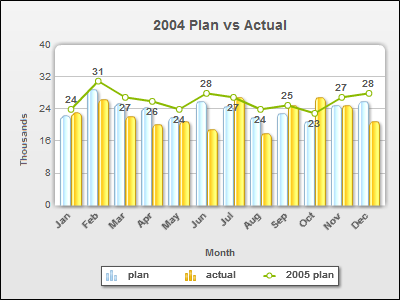 • Select "Plot" from the Chart use controls in the Report Columns section for the Plan and Actual columns. A title and axis labels can be added to the chart. • A Chart Title was added using the General characteristics controls. • X and Y axis Titles were added using the controls in the X axis and Y axis control groups. • The labeling of X axis tick marks is accomplished by setting a Report Column's Chart use to "Label". 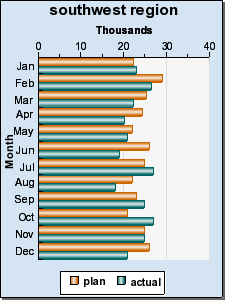 In this example, the "month" column was chosen. In addition, "Dec" was used as the Report Column Format so the month's short name would be displayed. 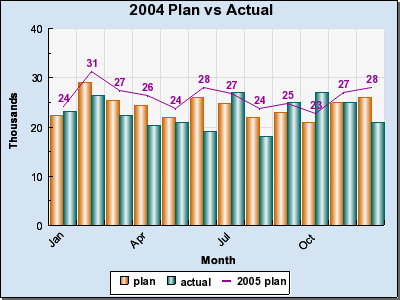 • The "2005 plan" column was added with the Chart use of "Plot+", which specifies to display the data values above the corresponding plot. 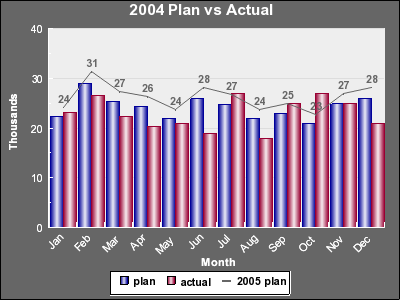 • The 2005 plan column number (5) was also specified to be plotted as a "lines in a bar chart" in the Advanced control group. • The Maximum value of the Y axis was set to "40". • The Legend location was set to "Center Bottom" of the chart in the Legend control group. The Position determines where the chart will appear in relation to the report data. This selection allows the User to select a FusionChart, JpGraph, or both for comparison purposes. The Orientation determines how the chart will be displayed. Portrait is taller than it is wide, and Landscape is wider than it is tall. The General style is used to select what type of chart will be produced. ⁃ Basic: Bars are grouped together next to each other. ⁃ Stacked: Bars are stacked on top of each other, with the data being cumulative. ⁃ Stacked %: Bars are stacked on top of each other, with values equaling 100% in total. ⁃ Basic: Typical line chart. No markers for data points. ⁃ Markers: Typical line chart with markers for data points. ⁃ Stacked: Lines are stacked on top of each, with the data being cumulative. ⁃ Stacked %: Lines are stacked on top of each other, equaling 100% in total. ⁃ Filled: Lines are stacked on top of each, with the data being cumulative. The area below the lines are color filled. ⁃ Filled %: Lines are stacked on top of each, equaling 100% in total. The area below the lines are color filled. ⁃ Basic: Flat pie charts. ⁃ 3D: Three dimensional pie charts. With 3D pie charts, the data labels will always appear outside the pie slices. ⁃ Basic: Typical plotting of X/Y values. ⁃ Impulse: A line is added to connect the plot point to the zero value of X axis. ⁃ Basic: Renders the dial as a semicircle. ⁃ Full dial: Renders the dial as a full circle. ⁃ The Odometer type is only available for JpGraph. A FusionWidget AngularGauge can be created using the Custom Layout. The size value controls the size (pixels) of the chart produced. When Landscape orientation is used, the first value is the width. When Portrait orientation is used, the first value becomes the height. 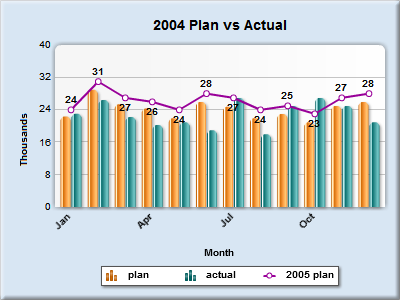 The smaller chart sizes are intended for use as charts that can be generated using QLR Manager's Report Object feature. With FusionCharts, the width of the chart can be specified as a percentage of the browser window, or parent container when used in a Custom Layout or Report Object. Entering a size value of 90%x300 will produce a FusionChart that fills 90% of the width of the window and will be 300 pixels high. JpGraph does not support percent calculations and will produce a strange looking chart that is 90 pixels wide by 300 pixels high. 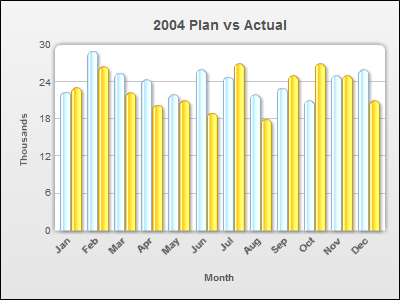 • Row uses each individual data row for plotting. This is typical. • Break1 uses the data found at the Break #1 level of the report. In order to use this level of plotting, some sort of Action, such as Sum, must be applied against the columns to be plotted. • Final uses the data from the Final summary of the report. In order to use this level of plotting, some sort of Action, such as Sum, must be applied against the columns to be plotted. This option provides selections for an outer border around the chart. The selections include None, Line and 3D Shadow. This font selection will set the global font to be used for all text in the charts, eg. axis labels, axis values, data values, legend labels, etc. Fonts for many of the chart attributes can be changed by selecting a specific font for the attribute, or leave the attribute Font face as "Chart" to use the global font. The Margin is the border area around the chart. The first color selection is applied to the chart margin. The second color is applied if a Margin gradient is selected from the adjacent select list. The gradient selections apply to the colors selected for the Margin colors and control the gradient direction. The gradient is only applied if two different colors are selected. 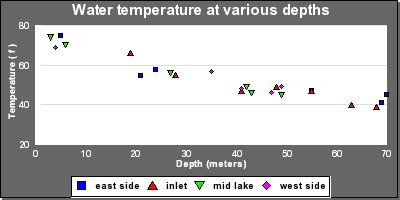 The plot area refers to the area behind the data plots. 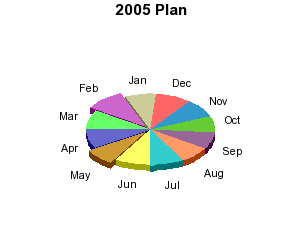 Some charts types, such as pie charts, do not have a plot area and the background colors are specified by the Margin colors. The first color selection is applied to the plot area. The second color is applied if a Plot area gradient is selected from the adjacent select list. • Fade to the right: The selected left color will fade into the selected right color. • Fade to the left: The selected right color will fade into the selected left color. • Fade down: The selected left color will be the top color and will fade into the selected right color. • Fade up: The selected left color will be the bottom color and will fade into the selected right color. • Alternate horizontally: The selected left color will alternate with the selected right color to create horizontal bands. The colors can be "blended" together using the Plot area color blending control found in the Advanced chart controls topic. • For FusionCharts, the "Fusion auto coloring" checkbox must be unchecked for the color gradients to be applied. • JpGraph can only apply a single gradient. When a gradient is set for both the Margin and the Plot area, the Margin color scheme will be applied to the overall chart. • JpGraph will not display the Margin gradient for horizontal bar charts unless the chart size width equals the chart size height. • The Plot area gradient cannot be applied to 3D FusionCharts. • The Plot area gradient cannot be applied to JpGraph Pie or Odometer charts. The Plot colors allow for the selection of colors to be used for each plot. 20 colors can be selected and the colors will be used in sequential order. If there are more plots than colors, the colors will be repeated starting with the first color. The following chart has a 3D effect with modified margin and background colors. This allows the User to control the border thickness that is rendered around the plot area. The size ranges from 0 to 5 pixels. When this option is checked, charts are produced using the FusionCharts default coloring scheme. To manually select colors for various elements of the chart, this option must be unchecked. 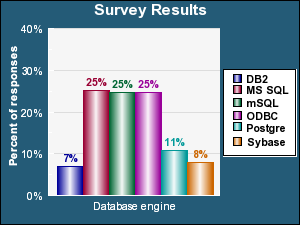 This selection has no impact on charts created with JpGraph. If checked and supported by the browser, this will force a page break between the chart and report table when printed. FusionCharts are created using HTML5 Canvas technology. They cannot be saved unless they are converted to an image format on the server. More information about the installation and configuration requirements for FusionCharts downloads is available in Installation help: E-mail or download FusionCharts. Including the save option will present a download tray icon in the upper right corner of the FusionChart and allow the User to select a JPG, PNG, or PDF download format. This selection has no impact on charts created with JpGraph which are images and can usually be saved by right clicking the chart and selecting the appropriate option from the context menu. When checked, this option will add a print icon in the upper right corner of the FusionChart that allows the User to directly print the displayed chart. This selection has no impact on charts created with JpGraph. A title can be entered to appear at the top of the chart. It is acceptable to use replacement strings within the title. A sub title can be entered by using a single vertical bar top separate the text, such as My Title|The sub title. The specific font can be used for the Title by selecting from the Font list. If "Chart" is selected, the font selected in the General characteristics controls will be used. The color of the Title can be set using the color selector. To use the selected color, check the "Apply" checkbox. Otherwise, the color will be set automatically by QLR Manager. For FusionCharts, the "Fusion auto coloring" checkbox, found in the General characteristics controls, must be unchecked for the selected color to be applied. The default selection for Title font size is "Auto". When auto is selected, QLR Manager will automatically calculate the font size for the title based on the size of the chart specified in the General characteristics controls. A title can be entered for the X axis. It is acceptable to use replacement strings within the title. The specific font can be used for the X axis and associated values by selecting from the Font list. If "Chart" is the selected, the Font selected in the General characteristics controls will be used. The color of the X axis and associated text can be set using the color selector. To use the selected color, check the "Apply" checkbox. Otherwise, the color will be set automatically by QLR Manager. For FusionCharts, the "Fusion auto coloring" checkbox, found in the General characteristics controls, must be unchecked for the selected color to be applied. The default setting for the X axis font size is "Auto". When auto is selected, QLR Manager will automatically calculate the font size based on the size of the chart specified in the General characteristics controls. When checked the axis label text is rendered as bold text. If True Type fonts are installed, the angle of the X axis labels can be set to be 0,30,45,60 or 90 degrees. Without True Type fonts installed, only 0 and 90 degree labels are supported. If angles other than 90 degrees are selected, they will be treated as 0 degrees. There are two ways to define the spacing for X axis labels. The "Frequency" method determines how often a label value is displayed on the X axis. The "Number of labels" method controls how many labels that will appear on the X axis. The first label value is always displayed. If there are X axis labels whose length makes them too long for reasonable display, the number of characters can be limited by truncating the values. The length can be limited between 1 to 12 characters. How the Spacing value is applied is dependent on the Label spacing method. If a value of 5 is entered and "Frequency" is selected, every 5th entry will receive an X axis label. If "Number of labels" is specified, then 5 labels will be displayed regardless of the number of X axis values. Both methods require that the number of X axis plots be evenly divisible by the Spacing value or QLR Manager will adjust the number of labels accordingly. This is the color applied to vertical grid lines when a value other than "None" is selected for Show grid lines. For FusionCharts, the "Fusion auto coloring" checkbox, found in the General characteristics controls, must be unchecked for the selected color to be applied. This option allows the User to select if X axis grid lines are to be displayed. The options range from None to 1 or 2 pixel solid, dashed or dotted lines. JpGraph does not support dotted and dashed lines. The color of the grid lines is controlled using the grid line color selector control. For this chart, the X axis frequency has been set to 3 and Show grid lines is set to be "Solid 1 pixel". This selection determines the font size of the labels along the X axis. A title can be entered for the Y axis. It is acceptable to use replacement strings within the title. The specific font can be used for the Y axis and associated values by selecting from the Font list. If "Chart" is selected, the Font selected in the General characteristics controls will be used. The color of the Y axis and associated text can be set using the color selector. To use the selected color, check the "Apply" checkbox. Otherwise, the color will be set automatically by QLR Manager. For FusionCharts, the "Fusion auto coloring" checkbox, found in the General characteristics controls, must be unchecked for the selected color to be applied. The default setting for the Y axis font size is "Auto". When auto is selected, QLR Manager will automatically calculate the font size based on the size of the chart specified in the General characteristics controls. The Y axis scale can be set to be either Linear, Logarithmic, or Percent. This option allows for the selection of the number of decimal places to be displayed for Y axis values. The Y axis values are automatically created when a chart is generated. However, the minimum value can be manually set in this field. Please note that depending on the relative size of the numbers needed in the Y axis, the value entered may be modified when the chart is created with a minimum value. The Y axis values are automatically created when a chart is generated. However, the maximum value can be manually set in this field. Please note that depending on the relative size of the numbers needed in the Y axis, the value entered may be modified when the chart is created with a maximum value. 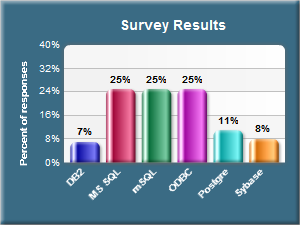 Following is an example of a Horizontal Bar chart with Portrait orientation. Notice how the X and Y axis have been rotated. The Y axis information now appears on the top for JpGraph and on the bottom for FusionChart. The Maximum Y value has been set to 40 and the Legend is at the "Center Bottom". The title was created with the string of "&c1 region", which used the data from report column number 1 to determine the region for the chart. This is the color applied to horizontal grid lines when a value other than "None" is selected for Show grid lines. For FusionCharts, the "Fusion auto coloring" checkbox, found in the General characteristics controls, must be unchecked for the selected color to be applied. This option allows the User to select if Y axis grid lines are to be displayed. The options range from None to 1 or 2 pixel solid, dashed or dotted lines. JpGraph does not support dotted and dashed lines. The color of the grid lines is controlled using the grid line color selector control. This selection determines the font size of the labels along the Y axis. This specifies the Location of where the legend will appear on the chart. The legend is comprised of a description of each of the sets of plot data. Depending on the size of the chart, and the number of items to appear in the legend, there may not be enough room to properly display the legend. It is up to the User to find a suitable placement for a legend. Note: A legend is not displayed for FusionCharts with a single set of plot data. If there are items in the legend whose length makes the legend too long for reasonable display, the number of characters can be limited by truncating the values. The length can be limited between 1 to 12 characters. Both the text and background colors of the legend can be set using the color selector. To use the selected colors, check the "Apply" checkbox. Otherwise, the color will be set automatically by QLR Manager. For FusionCharts, the "Fusion auto coloring" checkbox, found in the General characteristics controls, must be unchecked for the selected color to be applied. Note: When the legend background color is set the same as the chart margin color, the border will be omitted that surrounds the legend. This enables the legend to be blended into the chart margin. The specific font can be used for the Legend by selecting from the Font list. If "Chart" is selected, the font selected in the General characteristics controls will be used. The default setting for the Legend font size is "Auto". When auto is selected, QLR Manager will automatically calculate the font size based on the size of the chart specified in the General characteristics controls. The appearance of the Legend can be enhanced using the Legend border and Shadow controls. The border size can be set to None or 1 or 2 pixels in thickness. Checking the Legend shadow checkbox will provide a raised 3D appearance. Pie slices can be labeled in a variety of ways. The selections include no label (None), Percent, the actual Value, Legend-value, or Legend-percent. 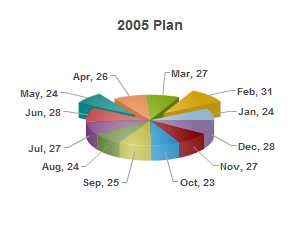 For JpGraph only, the Label can be set to appear inside or outside of the slice on Basic Pie Charts. For 3D pies, the label can only appear on the outside of the slices. If the plot data results in more than one pie created, this setting specifies the maximum number of pies to chart horizontally across the chart. Selections range from 1 to 4. 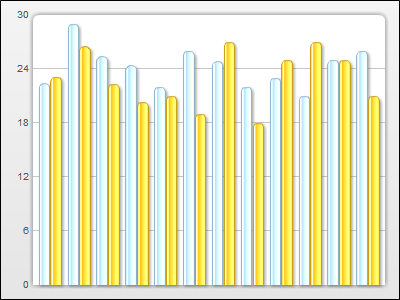 QLR Manager will support up to 5 rows of charts with 4 charts each, resulting in a maximum of 20 pies in a chart. This field allows the User to specify which slices to explode in a pie chart. If multiple exploded slices are desired, each plot number is entered separated by a comma. For example, to explode slices 2 and 5, they would be entered as "2,5". Slices can also be exploded by referencing their label values. For example "feb,may" can be entered to explode the slices associated with those labels. Label comparisons are case insensitive. When a doughnut chart type is selected, text can be added to the hole in the middle of the doughnut. FusionCharts will automatically perform word wrapping to format the text. For a JpGraph chart, a \n must be inserted in the text to force a line break. This option will provide a 3D effect to 2D pie chart. If the Specific type is not a Pie 3D or Doughnut 3D, beveled edges are applied to give slices a raised appearance. This option only applies to FusionCharts. When checked, the pie slice colors are used for the data labels. Odometers look like an old fashioned speedometer gauge in an automobile. These charts allow you to plot a single data point per gauge. Up to 25 gauges can be plotted in a chart. This control allows you to set the gauge indicator (the needle) style. Tthe color of the needle can also be set using the Needle color control. The color of the numbers that appear on the gauge are set with this control. The gauge numbering interval provides control over how often tick marks appear on a gauge and how often that numbers appear next to the tick marks. A setting of "50,2" would set tick marks to appear at 50, with numbers appearing every 2nd tick, such as for 100, 200, etc. This control allows the User to select the points at which the color pattern should change. The colors themselves are defined in the Plot Color control found in the General characteristics controls of Report Charting. If an entry of "300,600,800" is entered, 0 - 300 would get the first color of the Plot Colors, 300 - 600 would be given the second color and 600 - 800 would get the third color. Any area past the end of the range of these colors will be white. This determines the numbers of gauges to plot horizontally. Up to 5 rows of gauges can be plotted. These controls allow the starting and ending point for the gauge to be specified. If no values are given, the default of 0 and 100 are applied. When "Plot+" is selected in the Report Columns Chart Use control to include the plot values in the chart, the following options can be used to control the appearance of those values. This controls where the values are to be placed in bar charts. They can appear either inside the bars or outside the bars. When a "Stacked" type is selected, only the total value is displayed for FusionCharts. 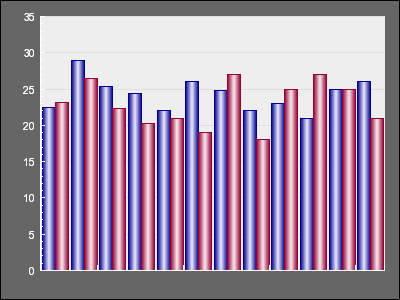 With JpGraph stacked charts, the values are shown at the top of the bar, but still inside the bar. The values are shown as either the actual value or can be "Auto formatted" so that large numbers are truncated with suffixes like K or M to represent the value. An example of auto formatting would truncate 2500000 to 2.5M. When auto formatting is selected, the values on the Y axis are also formatted. The specific font can be used for the Data labels by selecting from the Font list. If "Chart" is selected, the Font selected in the General characteristics controls will be used. The color of the Data labels can be set using the color selector. To use the selected color, check the "Apply" checkbox. Otherwise, the color will be set automatically by QLR Manager. The default setting for the Data label font size is "Auto". When auto is selected, QLR Manager will automatically calculate the font size based on the size of the chart specified in the General characteristics controls. 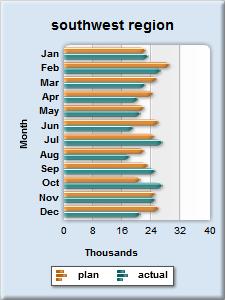 For bar charts, the Data label values can be displayed above the bars rotated 90 degrees. By default, the number of decimal places used to display the plot values is the decimal places set in the Report Columns section for that "Plot+" column. 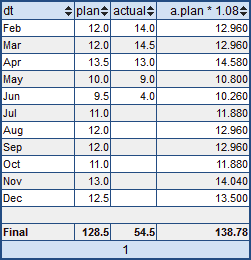 This Decimal selection will override the individual column settings and apply the desired number of decimals to all Data labels shown in the chart. When scatter charts are created, the first two selected plot columns are used as the X and Y plot values. This field specifies if the Y value is the first or second column found. The gradient selection allows the User to give their bars a "fading" effect. There are several settings: Vertical, Horizontal, Fade to top, and Fade to bottom. The following is an example of a vertical gradient setting. It also employs a Y axis scale type of "Percent" and a Chart use of "Plot+" to display the percentages above the bars. A legend is not displayed for FusionCharts with a single set of plot data. The Line thickness selection controls the pixel size of lines used in line charts or bar charts with plotted lines. When a line thickness of 1 is applied, anti-aliasing (line smoothing) will be used. Anti-aliasing can only be used with a thickness of 1. This is a limitation of chart generation software (JpGraph). 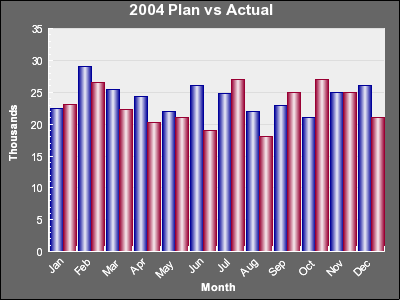 It may sometimes be desirable to create a chart that is a mixture of bars and lines. This can be accomplished by using a vertical or horizontal chart type, and then using this field to specify that certain plots (as referenced by their report column numbers) are to be treated as lines. If more that one plot is to be treated as a line, then the entries are separated by a comma. For example, to specify that the plots for columns 2 and 5 are to be line plots, they would be entered as "2,5". When using FusionCharts, the area below a line can be shaded by adding an 'a' to the end of a referenced line column, such as "2a,5". A 1 pixel border can be rendered around the data that is plotted, eg. between bars, pie slices, etc. In order to apply the selected border color, the "Apply" checkbox must be checked. For JpGraph charts, this effect is only applied to vertical and horizontal bar charts. However, with JpGraph pie charts when the "Apply" is checked, a slight separation between all slices will be present to give the appearance of a border between the slices, revealing the chart background or Margin color. When the Plot area gradient of "Alternate horizontally" is selected in the General characteristics controls with two different Plot area colors, the amount of color blending between the two colors can be set using this option. The allowable values are from 0 (no blending) to 100 (100% blending). This text area provides a means to enter FusionChart XML attributes not already available using the many controls available in the Report Charting section. If a particular XML tag has already been generated by QLR Manager, the value entered by the User will override the original setting. The above example will apply the first line of XML settings to all chart styles. When a style of "Vert bar" is selected, the additional XML will be applied and the legendIconScale of 1.6 will override the global setting of 1.4. This same approach can also be used at the Specific type level, such as "vert bar stacked". The above would use a legendIconScale of 1.2 when the chart style is "Vert Bar" and the specific style is "Stacked". This approach allows the User to customize all the different chart style and type combinations, and manage that information in a single Layout. This is particularly useful if the Layout settings are Set as defaults to be applied to all charts created by the User ID. The actual text and abbreviations to reference specific chart types are the selections available for General style and Specific type in the General characteristics controls. There are so many customization options for FusionCharts, it would be virtually impossible to address them all with HTML form controls in the Report Charting section. For more information about the formatting options, please visit the FusionCharts website. Value is greater than Only values greater than what is defined in the "filter value" field are plotted. Value is less than Only values less than the what is defined in the "filter value" field are plotted. Percent of total reached When selected, the plot data is first sorted from highest to lowest value. Data will be plotted until the desired percentage, as provided in the "filter value", is reached. For example, to plot the values that make up 90% of the total values to be plotted, enter 90 as the "filter value". A number from 1 to 100 can be entered. Top number of values When selected, the plot data is first sorted from highest to lowest value. Data will be plotted until the desired number of plot values is reached. For example, to plot the top 5 values, enter 5 as the "filter value". Label values This allows for the selection of plot data associated with specific label values. Label values are those values for the report column where the Chart use has been set to "Label". Multiple values can be entered separated by commas. If you desire to add a single plot that is comprised of the value of the items that were filtered out, check the "Plot sum of remaining values" checkbox. The "Remaining value label" is used to defined the X-axis value for the remaining data. None Column not used as part of the chart creation. Label The data in this column will be used as X axis labels, except for pie charts where it will be used as the slice labels. Plot The data in this field will be used as plot data. Plot is only available when the column contains numeric data. Plot+ The data in this field will be used as plot data. In addition, the data value will appear above the plot in Bar and Line charts. Plot+ is only available when the column contains numeric data. The Plot and Plot+ options only appear for numeric columns. This may present a problem if the User wishes to plot the results of applying the "Count" action to a column of non-numeric data. The work around for this situation is to add an addition column to the query select list, such as 1 as count. An Action of Count or Sum can be applied to the data in this new column. The data will be treated as numeric in nature, allowing the Plot and Plot+ Chart use options to appear. Scatter charts are intended to plot two related sets of column information. One of the plot sets will determine the X axis values. The other will determine the Y Axis values that are plotted. If only one column is specified, it becomes the Y axis data. The X axis will be set as a sequential frequency. If more than two plot columns are specified, the extra columns are ignored. The example below demonstrates a scatter chart's features. 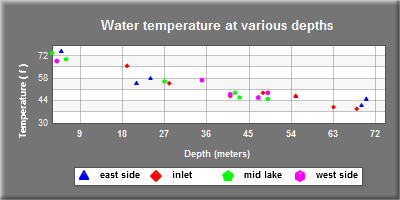 • The first column of plot data (depth) has been identified as the Y axis column. See advanced controls for more information about selecting the 1st or 2nd column as the Y axis column. • When a Break1 is specified in the Layout, each set of data becomes a "Plot Set". • Each plot set is assigned a different symbol. • When more than one plot set is found, Legend data is available for use. There is no Legend information for a single plot set (i.e. no Break1 in the Layout was found). QLR Manager supports the rendering of report data as a FusionWidget. A FusionWidget is a type of FusionChart that generally plots a single data point or a single set of data. A trial version of FusionWidgets is delivered as part of the QLR Manager install package and included in the /fusioncharts directory. • An HTML <div> tag which is the container that will hold the FusionWidget. An example of FusionWidget code that could be entered into the Custom Layout textarea is provided below. Note: Addition HTML and text can also be entered into this textarea. It is not limited to the tagging to create the FusionWidget. width:XXXpx"> This outer div container will center the FusionWidget horizontally. The value supplied for width should be the same value provided for the Widget width in the new FusionCharts constructor. It is optional extra HTML and not required by FusionWidgets. • The first is the path and filename of the type of Widget you wish to produce. 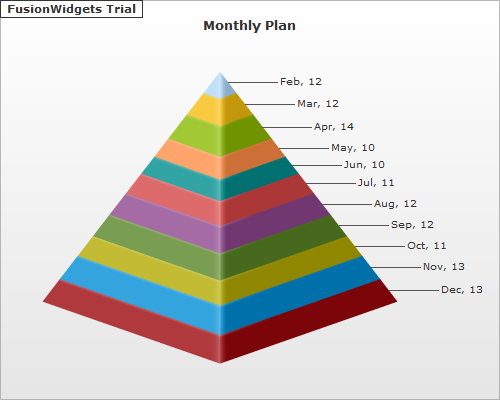 The available FusionWidget files are found in the /fusioncharts directory within the QLR Manager file structure. • The next paramater, "myChartId", is a unique identifier used internally by FusionCharts. • 400 is the widget's width in pixels. • 200 is the widget's height in pixels. • 0 (zero) is a FusionWidget parameter to set debugMode to off. • The data starts and ends with quotes. The starting and ending quotes can be either single or a double quotes. • The quoting of the values inside the XML then uses the quoting not used for the overall quoting. So if the total input is surrounded by double quotes, then the XML data is surrounded by single quotes. • if the XML contains special characters, then their HTML entities must be used. For example, an ampersand is &amp;, an apostophe is &apos;, a double quote is &quot;, < is &lt;, and > is &gt;. • Report values can be referenced using the QLR Manager replacement strings. &f10 references the Final value in report column number 10. When a final value is referenced then a Column Action, such as Sum, needs to be used to create the final value. &n2 would reference the value in the 2nd column in the last row of the report. </div> This will close the outer div container. It is optional extra HTML and not required by FusionWidgets. This is supported in QLR Manager by the User setting up a "template" XML tag in between the opening and closing tags listed above. Within the template tag, the replacement variable is defined. In the example below, the widget will access all data in column 7 generated by the query. Note: A replacement variable of &n8 was also applied as a paramter to set the caption value of AMZN.